My family has a tradition that we honor at the beginning of every school year that we call “goodbye old pals.” As kids, it was a way to celebrate the start of the new school year and, maybe for our parents, the fact that we weren’t going to be around the house as much (but don’t worry – they always threw us a “hello old pals” party at the end of the school year). Well, today I’m throwing myself and Pinahsi, our New Kingdom mummy from Abydos, our own little goodbye old pals party here in the Artifact Lab, because he is leaving the lab on Monday to go back on exhibit in our Secrets and Science gallery. Pinahsi has been in the lab for several months for conservation treatment and documentation. I’ve already written a bit about the treatment here and here, but I’ll provide a summary below using some of the before and after treatment images. The treatment of Pinahsi’s remains was limited to the external wrappings – nothing, with the exception of a very light surface cleaning, was done to any of the exposed human remains (and only his feet are exposed). The goal of treatment was to stabilize the wrappings that were susceptible to further damage and deterioration. After surface cleaning, tears in the linen were repaired with tiny strips of Japanese tissue paper and methyl cellulose adhesive, all carried out from the underside of the linen. During Japanese tissue and methyl cellulose repair (left) and after mends were complete (right). After tear repair, very fragile areas were encapsulated with nylon bobbinett, toned with acrylic paint to blend in with the original linen. Before encapsulation with nylon bobbinett (left) and after (right). Here are some overall before and after treatment images. The difference is pretty subtle, but that was pretty much the goal – to stabilize what’s there using the least invasive methods possible. Overall view from above of Pinahsi before (left) and after (right) conservation treatment. View from the right side of Pinahsi before (above) and after (below) conservation treatment. Notice the new support board under Pinahsi in the after treatment image above. This board will eliminate most direct handling of his remains, and will also provide support for his remains while on exhibit. This additional protection will also help to prevent further deterioration of the linen wrappings. With Pinahsi stabilized and on his new support board, we were able to safely move him down to our new digital x-ray lab, and with the assistance of Dr. Janet Monge and Dr. Morrie Kricun, Conservator Tessa de Alarcon and I captured a complete set of x-ray images. While full interpretation of the images is underway, I will share a few of the initial findings that were impossible not to miss. 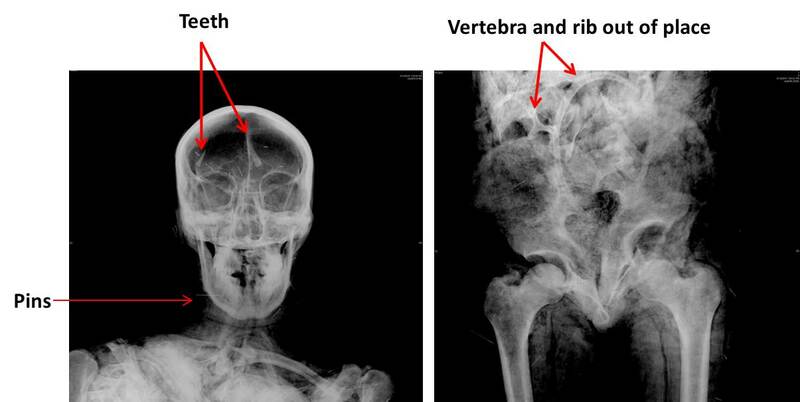 X-ray images of Pinahsi’s head (left) and abdomen/pelvis (right). Age is determined by examining the condition of the bones and teeth. You may notice some things that are out of place, like the teeth that appear to be in the cranial cavity and the ribs and vertebrae where they shouldn’t be, and the pelvis askew. X-ray images of Pinahsi’s skull and abdomen, labeled with elements that are out of place. Note the very tiny pins – these are actually part of the new storage support, being used to secure the fabric to the board – they’re not part of Pinahsi at all! Another observation of note is that Pinahsi’s arms are crossed over his chest. 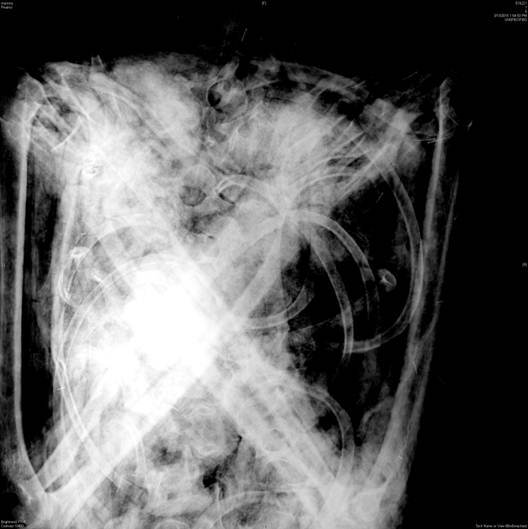 X-ray image of Pinahsi’s chest and arms. This arm position was generally not seen until the New Kingdom, when it was reserved for royalty. Does that mean that Pinahsi was part of a royal family? Maybe! But maybe not. We’ll need to do some research to answer this, and to try to understand why his remains are so disturbed under the wrappings. I’ll share information as we learn more. Well, Pinahsi old pal, it’s been an honor to have you in the lab. I’m glad that we were able to spend this time together, and I’m also happy to know that our work is not complete, so we have more fun times to look forward to! 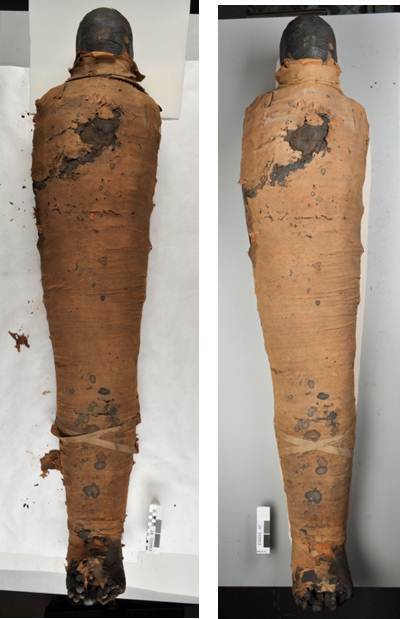 This entry was posted in conservation treatment, imaging, Mummies, Objects In the Artifact Lab, on exhibit and tagged 19th Dynasty, Abydos, digital radiography, human mummy, New Kingdom, nylon bobbinett, Pinahsi, x-radiography, x-ray by mollygleeson. Bookmark the permalink.